It’s getting to be that time of year. The rains are making all this snow look like it might actually melt before July! As the drizzle drizzles, spring cleaning has become something I’m definitely starting to think about. Maybe at some point I might actually even start it! This is the time of year where I start to really review my pantry contents, and to check in on those items that are in danger of becoming petrified at the bottom of my chest freezer. This morning, I checked my freezer inventory lists (taped to the top of my chest freezer and updated regularly) and noticed a lovely slab of wild-caught salmon was awaiting some attention. I love glazed salmon whether it be maple, balsamic, brown sugar, honey, or tonight’s pick, hoisin sauce. I have a go-to hoisin concoction adapted from an older Cooking Light recipe. As my oven preheated to 400, I whisked together 1 tablespoon of hoisin sauce, 1 teaspoon of low sodium soy sauce, and about 1/4 teaspoon of dark sesame oil. As I still have 3 oranges in a bowl on my counter, I decided to incorporate a healthy squeeze orange juice into the mix as well. I lightly sprayed my baking sheet, laid out my piece of salmon on it, and coated the salmon with the hoisin mixture. 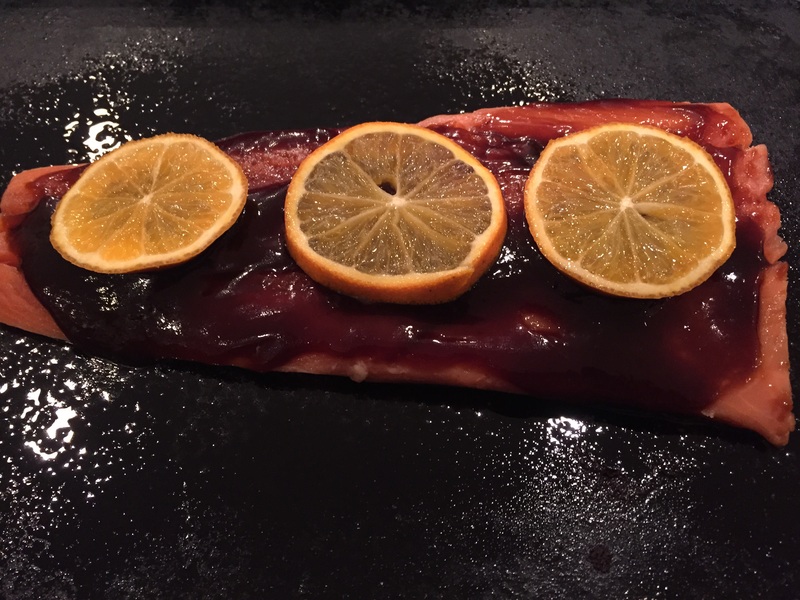 A few slices of orange went on top of the salmon and into the stove it went until it was cooked, about 8 minutes. 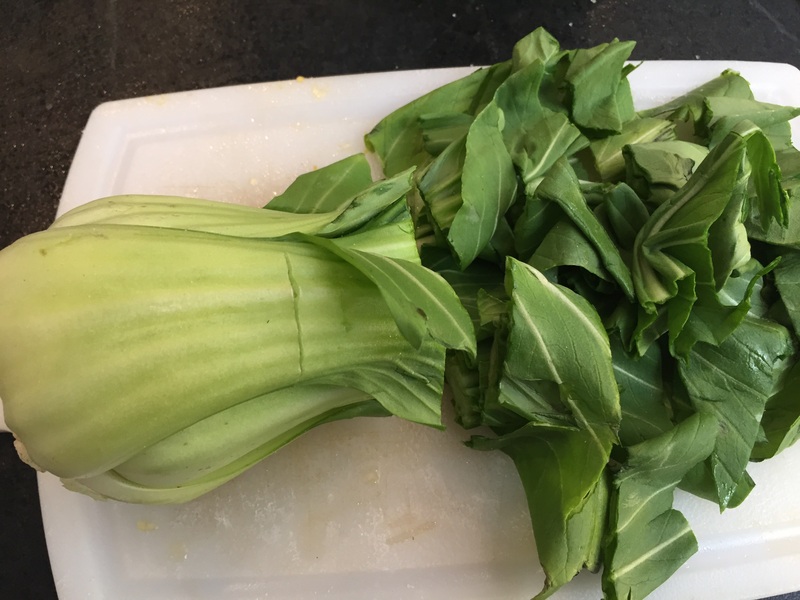 I had another Cooking Light Recipe adaptation for a Bok Choy Salad with fried shallots, and considering I had a couple of shallots in my veggie bin to use, the timing for this recipe was serendipitous. As I tasted the dressing for the salad, I decided to add some orange juice to that too. 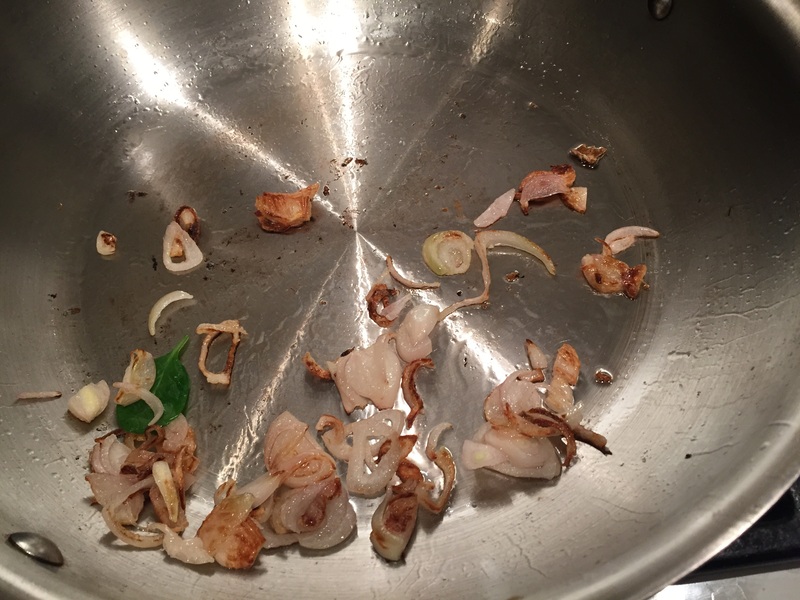 After starting to fry up the shallots (looks like a spinach leaf snuck in the picture), I couldn’t help but toss the bok choy greens and some spinach in the pan with the shallots for a quick wilt. This salad also works without the wilt. This was great on a bed of jasmine rice. At 8 minutes, I accidentally overcooked this thin filet a tiny bit. Even so, it was scrumptious. If I had it to do over again, I might have tried an maple cider glaze to incorporate even more of the Springdell goodness. Alas, we devoured this version in mere moments. This recipe makes 2 generous servings with a little left over. You can easily double it as needed. The directions are for both the salmon and the bok choy to be made simultaneously so they are ready at the same time. Also provided is the raw bok choy salad version and the stir-fry version. Give it a solid read-through before attempting as this recipe moves quickly once started. As the whole thing takes only 10 minutes start to finish, you can cook your rice/noodles while prepping the other ingredients. For the salmon, whisk together hoisin sauce, orange juice, soy sauce and sesame oil. Spread the mixture on the salmon filet in a rimmed dish. If your mixture is watery, let the bottom of the filet marinate in the watery part for a few minutes before transferring to a sprayed cookie sheet. Top with orange slices. For the bok choy, whisk together rice vinegar, soy sauce, orange juice, and Sambal Oelek. Set aside. Meanwhile, heat a medium skillet over medium high heat, then add the oil. Quickly toss your shallot rings with the cornstarch until just coated, then put them in the skillet. For the raw salad, toss the bok choy with the sauce and place the crisped shallots on top. 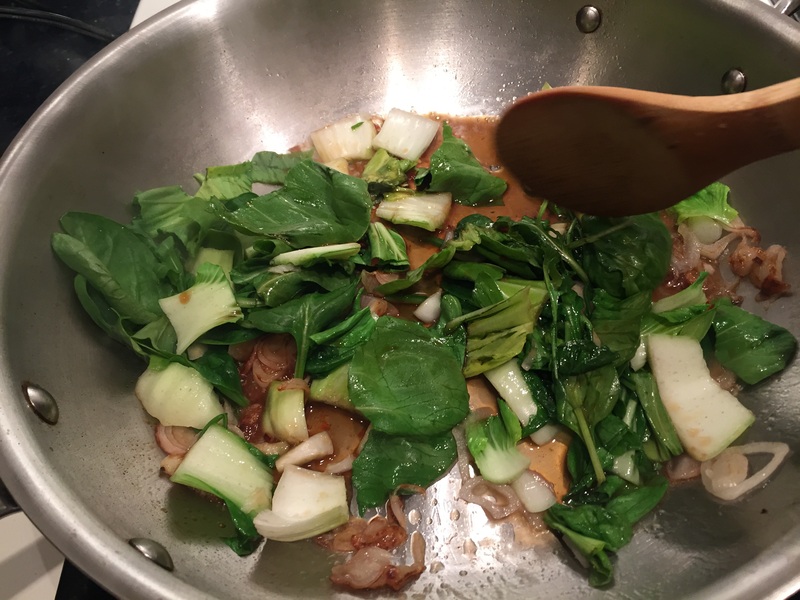 For a warm stir fry, remove the crisped shallots and add the bok choy to your pan along with the sauce until the greens are just wilted. Place the crisped shallots on top. 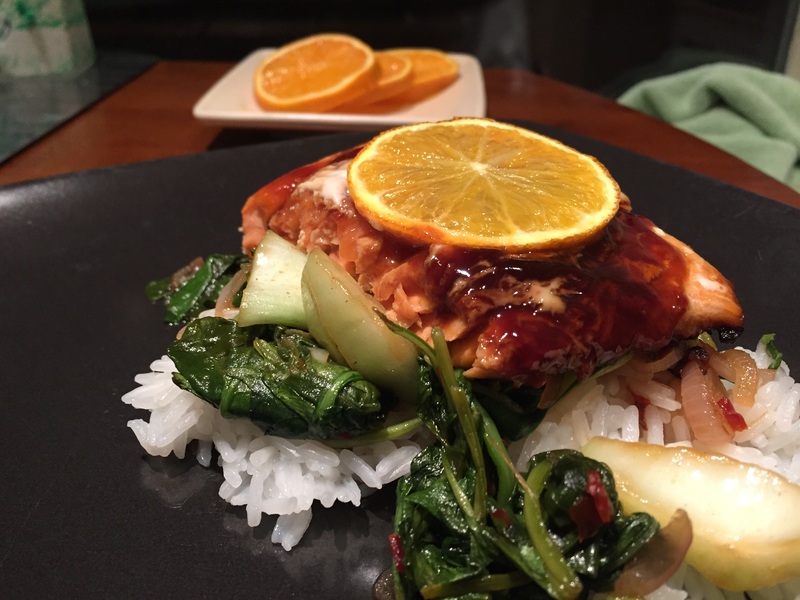 By the time your bok choy is ready, your salmon should be as well. Serve both hot atop a bed of rice or noodles. Enjoy! Garnish with toasted sesame seeds at the end for an added crunch! In place of lemon, some oranges on the side are a nice accompaniment. How are you enjoying your bok choy and oranges? We’d love to hear from you!